This completely updated third floor condo has the best views in the community. See all the way to the Morris Island lighthouse from the balcony and Wild Dunes from the front door. 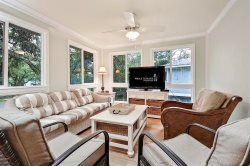 Just steps from the beach, private fishing pier, Isle of Palms County Park, and pool. The kitchen includes upgraded cabinets and counter tops, plus new stainless steel appliances including a French door style refrigerator. The cozy bedroom, typical to Sea Cabins, has been opened up to the rest of the condo with glass French doors. No feeling cramped here! The addition of a built in dressing vanity/workspace with upper cabinets in the hallway makes this area very functional. The condo sleeps 4 with a queen size bed in the bedroom and a queen sleeper in the living area. Sea Cabins are the perfect place for a family get-a-way or romantic vacation. Outstanding customer service! The women who answered the phone was outstanding! She had the best customer service I have ever had! Best sea cabin we have ever stayed in. Appreciated the fully stocked kitchen and many hooks throughout to hang items on. Sofa bed and bed comfortable. Very clean!! View spectacular!! Honeymoon Heaven We stayed here on our honeymoon. The place was clean and well maintained. So close to the beach with an awesome view of the ocean. I would stay here again in a heartbeat! This place was ideal for a quiet, beach getaway. The hosts could not have been more helpful in setting up accommodations via email. The apartment was literal steps from the beach in a pleasant area on the Isle of Palms. It was also so well stocked with kitchen appliances we cooked-in more than we expected. We could not have been more content with our selection. Beyond sad to leave. Had a wonderful time! GREAT LOCATION! loved the views and breeze from the balcony. We enjoyed being that close to the beach and pool! Comfortable and quaint set up! The host was a big help in pre-trip information and the in-unit welcome kit took care of any questions. This location worked out just perfectly for us as all we wanted to do was to spend a week on the beach. To our surprise their were several great restaurants within walking distance and don't forget the convenience of Harris Teeter for food and incidentals. We've been visiting IOP since 2004 and think we've found our perfect location! We had some issues with the wireless and a ceiling fan when we arrived. Whitney was very helpful in trying to help us resolve and then sent someone over to assist us. Once we got over that initial hump the rest of the week went without issue and we could just relax and enjoy. Love IOP and the Sweetgrass property was great! Favorite feature: Proximity to the beach, decor, amenities. We'd definitely consider staying again. I worked with Deb Thomas to reserve our cabin. She was very professional and extremely helpful starting with our very first conversation! I appreciated the packet of information left for us in the cabin - it was very helpful. Thank you, Deb, for helping us to plan this wonderful vacation! We loved every minute of our vacation! Our cabin was beautiful, clean and had a fantastic view! The property is well maintained and in a very convenient location; central to everything we needed. Check in and check out is a breeze! We visited South Carolina after dropping our last children off to college. It was a perfect getaway as we now enter into a new chapter of our lives as "empty nesters". Your beach home is just beautiful. Thank you for all the "small touches" that make it perfect! We hope to return next year! We celebrated our first anniversary here at your cute condo and the beautiful Isle of Palms. Love the dcor - beautiful colors. Picture perfect weather and nice relaxing weekend getaway.